The Green Girl stopped by her favorite Phiten store in Torrance after work today and the awesome salespeople gave her some samples for a blog giveaway. 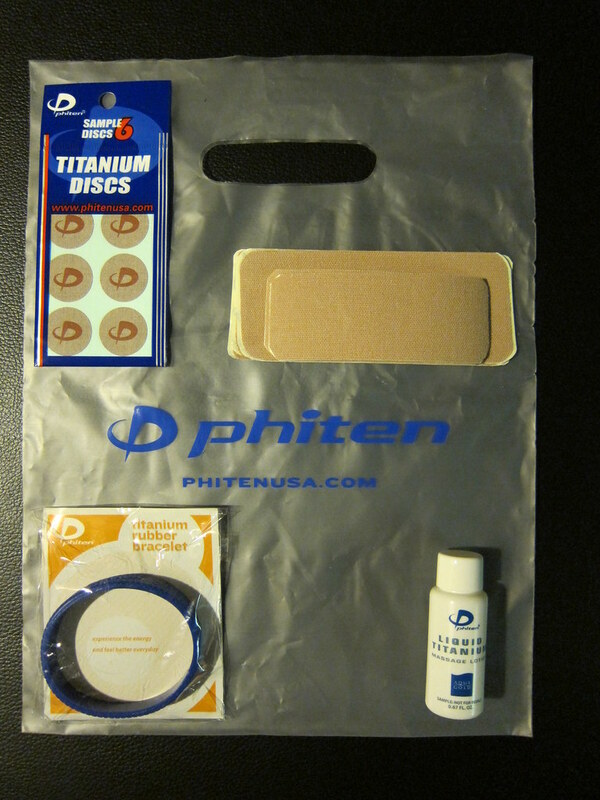 As I mentioned in the past, I am a huge fan of Phiten products. Phiten is named after "phi Φ," which symbolizes a perfect balance in the natural world. The Phiten company was founded in Japan in 1982 by Yoshihiro Hirata, an alternative medicine practitioner. Phiten's scientists discovered a method of dissolving titanium in water to create micro-titanium spheres. They refer to this as the Phild Process. Phiten's 'Aqua-Titanium' is composed of these micro-titanium spheres that are absorbed into fabric like dye. This Aqua-Titanium is used in the Phiten necklaces and apparel. According to Phiten, their products can improve your circulation and reduce muscle stress based on the theory that stiff muscles and fatigue may be caused by distruptions in the flow of your body's bio-electric current. Phiten says the entire fabric is permeated with the Aqua-Titanium and is capable of emitting energy to effectively control the body's bio-electric current to improve the alignment of the body's positive and negative ions. One entry per person. The deadline to enter is Thursday, August 5th at midnight Pacific Time. The winner will be announced on Friday, August 6th. I'm intrigued by the Phiten products. I suppose I'm a bit skeptical, but they certainly can't hurt. Consider this my entry via replying to this post. I want to try these out!! I hear so much about this stuff. Non-believers become believers. Maybe it would help my knees. Wow tihs sounds really cool. Never heard of it before. This intrigues me. I'd love to try it. Hi there and pretty cool. Rad Runner is always mentioning you so I figured I'd stop by. Never heard of these, but they sound intriguing to try. I've never heard of these products (and not sure why I haven't...I've been to every expo under the sun I think. ha) but holy cow, I think my heel needs this! Someone told me the other day I needed to tape the dang heel, but I had no idea where to get the tape! So here's my official entry to your contest, cuz I can definitey use it :). Looking so forward to seeing you in a few days :)!!! Yay!!! I hope I win, I would love to see how it works! I wounder if this could be my cure for my wrists? sounds great - thanks for the chance! very interesting. I'd love to give this a try! OHHH Pick me pick me! Ahhhhhhhhh-mazing Phiten is just plan ahhhhhhhhh-mazing.. And thanks to you I know all about the Phiten magic!! !